There’s absolutely no escaping it. With a majority of businesses using social media today, customers and users aren’t shy of collaborating with brands using these channels. In fact, a study done by Insites Consulting finds an increase in willingness among social media users to collaborate with brands on social media. 64% of the respondents said that they were willing to collaborate & help brands improve customer service whereas 59% mentioned that they would help brands in the development of a new product or service. 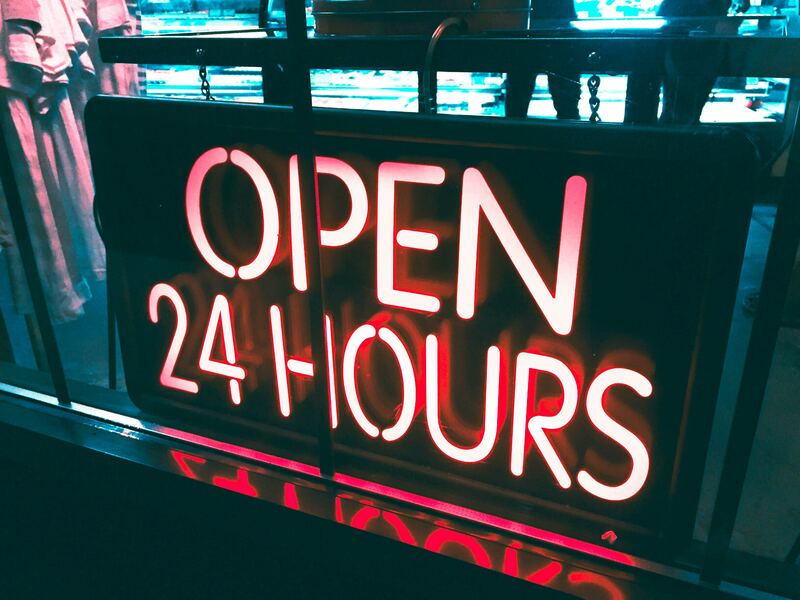 This simply proves what the social media experts have been saying for a while — Customers are increasingly looking at social media as a customer service channel. It’s simply not wise to ignore social media anymore, more so when it comes to customer support & service. A company that’s just starting out with customer service on social media will have to streamline and create a process around it that fosters customer delight and a positive sentiment among their followers. So what’s the most productive way of doing this? Well, there are many and they all depend on a variety of factors i.e. social media followerbase, size of support team, tools a company currently uses etc. Here is a quick rundown on how we manage social media customer service using Brightpod. 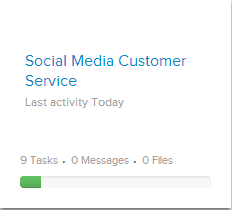 Social media customer service projectTo track this in one place, we’ve created a pod (project) called Social Media Customer Service. This helps us track a social media query from start to end. 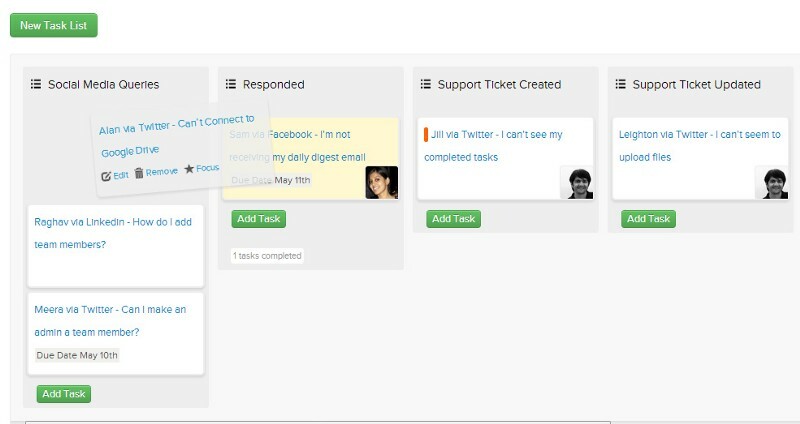 Task lists for each point in a customer support queryWith Brightpod, it’s super simple to create different task lists where we can enter in the status of a ticket or social media mention. It looks like a kanban board and makes it ridiculously simple to add tasks and assign them to the relevant team member from here. Alan isn’t able to connect to Google Drive using Brightpod and he sends me a Twitter DM. 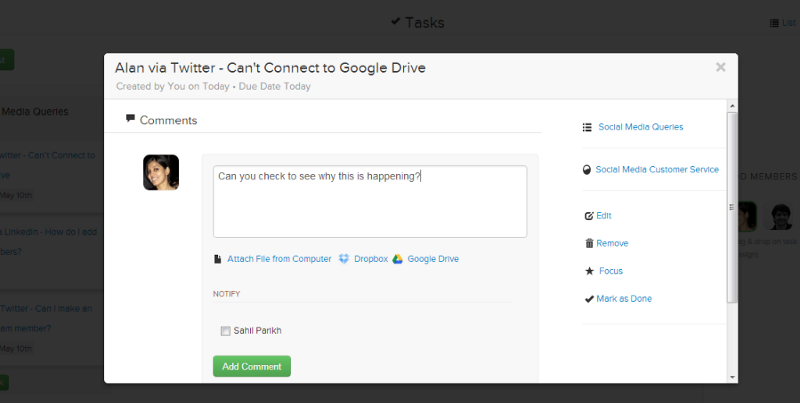 First, I add his query as a task to the task list ‘Social Media Queries’. I then respond to him saying that our lead developer, Sunil, is looking into the issue and we’ll get back to him ASAP. I then drag the query to the ‘Responded’ task list. Sunil then creates a support ticket for him and drags the query to the ‘Support Ticket Created’ task list. After some digging around, Sunil figures out the issue and updates the ticket with an ETA. With that he drags the task to the task list ‘Support Ticket Updated’. About an hour later, Sunil, has resolved the issue and everyone is happy :) So he closes the ticket and moves the task to ‘Support Ticket Resolved’. Once that is done, I respond to Alan once again on Twitter letting him know we’ve fixed the issue and then move his task to the ‘Final Update on Social Media’. Only once all this has been completed, do we mark the task as done. Complete AccountabilityThe biggest issue with social media customer service is the lack of accountability, especially in SMB’s without a dedicated social media manager. It’s easy for mentions to go unnoticed and support tickets delayed. This method makes that possibility a lot lesser. With each step, it’s possible to track who’s handling the issue and what the ETA is. Step-by-step ProgressLike I mentioned earlier, the entire pod is like a kanban board that tracks different steps in the entire cycle. How does this help? Well, say, Sahil (our CEO) wants to see what’s happening with certain high priority support issues. Instead of coordinating with 2 or 3 team members, he can simply look at the flow view and track the progress of each issue. Easy CollaborationIt’s silly to assume that every support issue is resolved as seamlessly as the one I described above. More often than not, there are several conversations between the support rep and the client or between team members to replicate the issue, pinpoint why it’s happening and eventually resolve it.Brightpod makes that amazingly simple.Each task has the option to add comments and even upload files so that collaboration happens within Brightpod and there aren’t any accompanying email threads anyone needs to refer to.